BOSTON, MA -- We've got another big week on tap in the Eastern Hockey League Premier (EHLP), as once again, all 12 teams are in action over the next 4 days. With at least 1 game each day through Sunday, there are many key points on the line. The Little Flyers and Renegades are set to face-off for the 2nd time since the 2018 EHLP Playoffs. These 2 teams matched up as the #4 and #5 seeds during last year’s postseason, with the Renegades winning a thrilling 3-2 game in overtime. Following Saturday’s matchup, these 2 rivals will face-off 4 more times during the regular season. Below you'll find the full schedule for the week, and the next set of TSR Hockey Stars of the Week will be released on Monday, October 29th at 4:00pm. 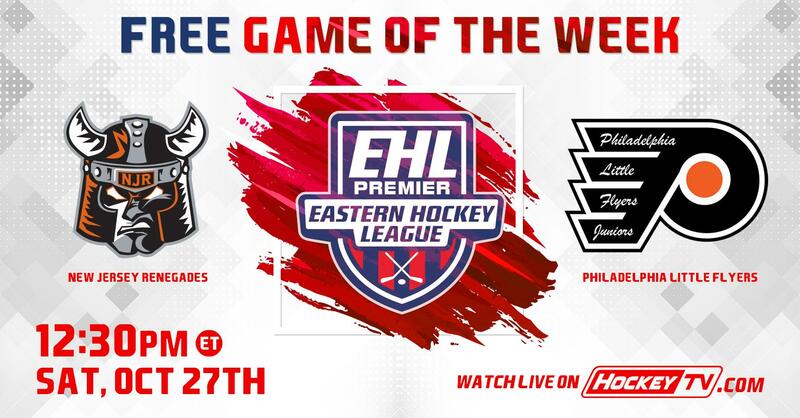 Catch the EHLP action all season long on HockeyTV.